What happened to Olive Garden? 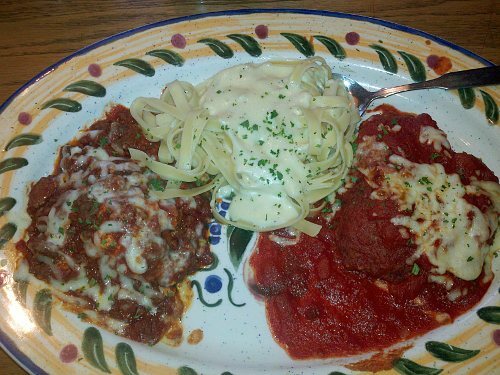 "Back in the day" the portions at Olive Garden were awesome. It was common to have a "take home box" with the left over portions. It has been a while since we have been into an Olive Garden. We stopped frequenting them (multiple locations) after repeated issues with extremely long waits to get a table during family outings. Last night Ben decided that he wanted to go there for to celebrate his birthday. We were running errands in St Cloud so we stopped in at the nearby Olive Garden location. There was no line at the door which was a nice change. The meal was nice... but extremely small. Clearly Olive Garden is NOT the deal that they used to be. I think that I will vote with my wallet and take my business else where. --It was nice knowing you Mr & Mrs Olive Garden.